Delivery can be organised to anywhere in Australia. Magnifiers with 5 and 12 dioptre lenses plus strong 28 watt Lighting (#CAPG010). Price: $245.00 incl GST BUY - Sorry item out of stock. Postage available within Australia at an additional charge. Features: High quality rectangular Glass lens (18.75 x 15.5 cm). Magnifying strength is 5 dioptre (2.25 times). Additional detachable 12 dioptre (4 times) small lens. 28 watt energy saving Fluorescent globe. Can also be fitted to a portable Floor Stand (Pedestal). Power rating - 240 volts, 50 Hz. CAPG002B Mag Lamps have easily adjustable spring balanced arms and fitted to a removable black heavy mobile base. on pedestal using Fluorescent Lights powered by 2 x 9 watt Bulbs. This model has been purchased when a large lens area is required such as for knitting, reading, embroidering or other handy craft. These Magnifying Desk Lamps come with a 12 watt Bulb and a 5 dioptre Lens with a 12 dioptre section. CAPG005 Magnifier and LED Lighting - LED Lights consist of 60 diodes. These LED Magnifying Lamps are easily portable and fits in confined spaces. CAPG006B Lamps and Magnifier - 22 watt bulb for Light. These Desk Lamps with a goose neck arm provide flexibility and includes a mounting fixture. CAPG008B Lamps and Magnifiers using 22 watt bulbs for Lights. This black model comes with a mounting device. CAPG008W Lamps and Magnifiers using 22 watt Light. Mounting device for attaching to a ledge included for stable use. This has been a long standing favourite of Beauty therapists. CAPG012W Magnifiers using 2 x 9 watt Bulbs as Lights. Includes large rectangle 5 dioptre Glass Lens. Purchased by many who suffer from macular degeneration and want to continue performing their hobby or interest. have a rectangle 5 dioptre Glass Lens with a 2.25 times Magnification. CAPG041 LED Magnifier with Lights using 108 LED diodes for Lighting. Mobile heavy Stand included which enables steady long horizontal reach. 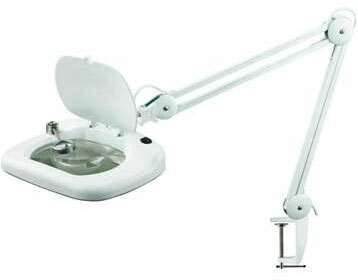 CAPG070 Desk Magnifier and Light (using Fluorescent Lamp). Sturdy base. CAPG090 LED Magnifier and Lights. LED Lights consist of 90 diodes circling the lens. These LED Desk Lamps have a horizontal arm reach of ? cm. Our best selling LED Magi. CAPG091 LED Magnifier and Floor Stand. Lights consist of 90 LED diodes. These Lamps have been purchased mainly by eye lash Beauty consultants. CAPG001WL Round Magnifying Glass with 5 dioptre Lens. CAPG003WL Large replacement Glass Magnifying Lens. CAPG030B Heavy Stand for black Magnifiers. CAPG030W Heavy Stand for white Magnifiers. CAPG031B Stand for black Floor Lamps. CAPG031W Stand for white Floor Lamps. CAPG050W White Wall Brackets to hang Lamp from wall. CAPG051B Large Bench Bracket - black. CAPG051W Large Bench Bracket - white. CAPG052B Bracket for black Magnifiers. CAPG052W Bracket for white Magnifiers. CAPG053 Light Bulb (9 watt) for CAPG012 Lamps. CAPG053A 9 watt Light Bulb for CAPG012 Lamps. CAPG054 22 watt Light Bulb for CAPG008 Lamps. CAPG056 Light Bulb (28 watt) for CAPG010 Lamps. CAPG057B Table mount for black Magnifiers. CAPG057W White Table mount for white Magnifiers. LED Magnifying Lamps, spare parts and accessories delivered Australia wide. Online payments accepted with MasterCard, Visa or PayPal. * Table, Floor Stand Magnifiers and Desk Clamps available. * All Magnifying Lamps can be inspected at our Canberra store.